The holidays are a magical time. Full of joyful memories and traditions. Which is comforting, but it can also leave you in a rut year after year. Especially when it comes to the food! That was me recently while planning our contribution to a neighborhood Friendsgiving celebration/block party. So I ditched all our family favorites in favor of something new, this Sausage Farro Stuffing. Which has already become a NEW favorite! Even though I call this dish Sausage Farro Stuffing, I guess technically it’s more of a dressing. You know people come to blows when debating those two terms. You might even consider it a warm salad. Regardless of the name, you are going to love its nutty richness. 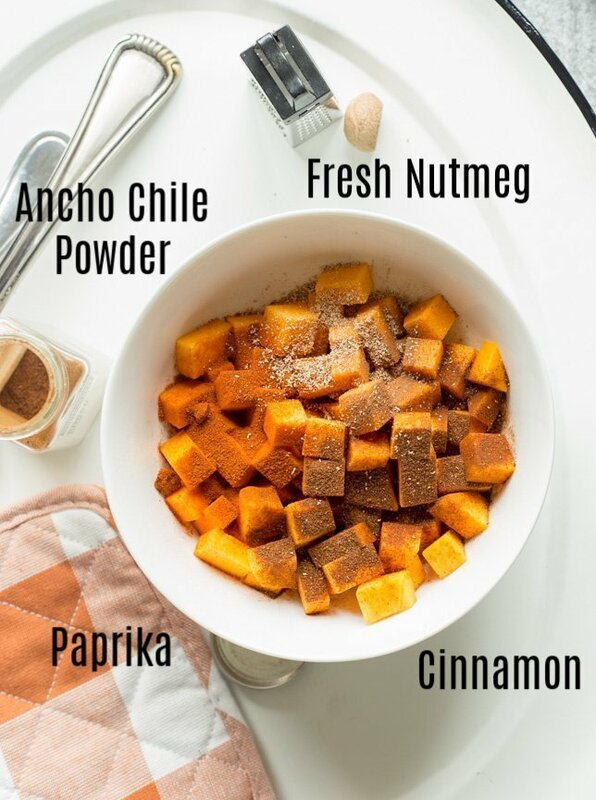 Cooking the farro with diced butternut squash and warm spices like ancho chile, cinnamon and freshly grated nutmeg gives the dish a texture similar to risotto. The squash simply melts into creaminess! I would LOVE for this to be a vegetarian dish, but my meat-eating husband stood his ground on this one. 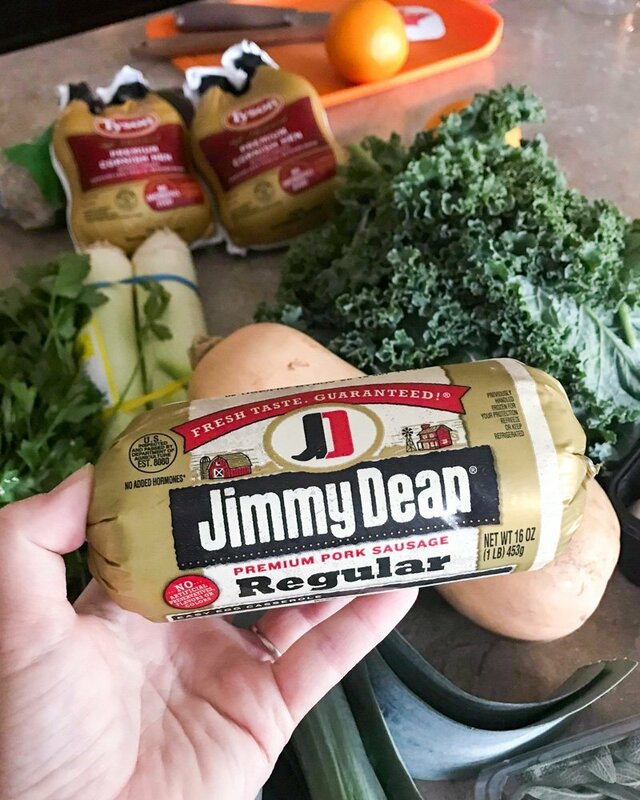 He’s willing to forgo our classic bread stuffing, but the substitute HAS to have Jimmy Dean® Sausage. And I agree, it is a timeless holiday recipe ingredient! We even grabbed extra for biscuits and green chile sausage gravy over the weekend. Friendsgiving Tip #1 – Write a master list and shop in one place. Once upon a time I would run around to three or more stores to get food, beverages and decorations for a Friendsgiving celebration. Which totally stresses you out! Now I can get it all done in one trip to Sam’s Club. I start with the menu ingredients for each dish first. Then check to see if I need any special cookware or utensils to make each dish. Do I need extra serving utensils? Those all go on the list. 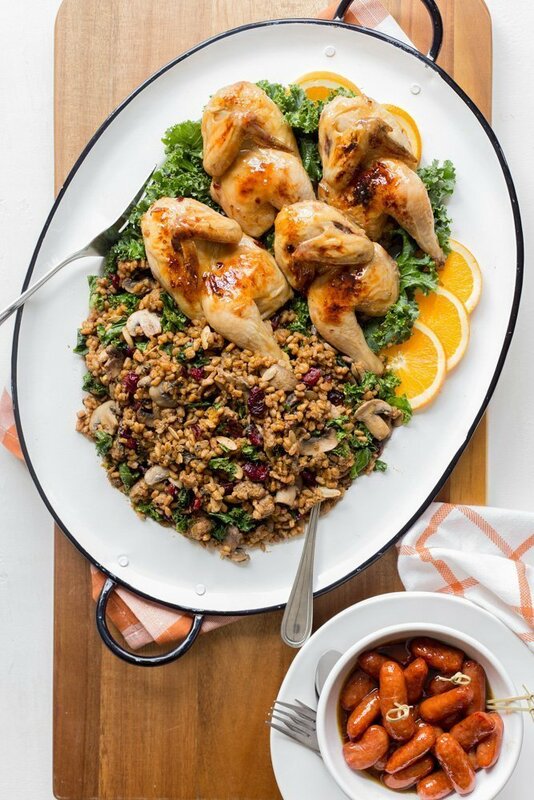 We are having my Sweet Chipotle Cornish Hens to go along with the Sausage Farro Stuffing so those landed at the top of my list. 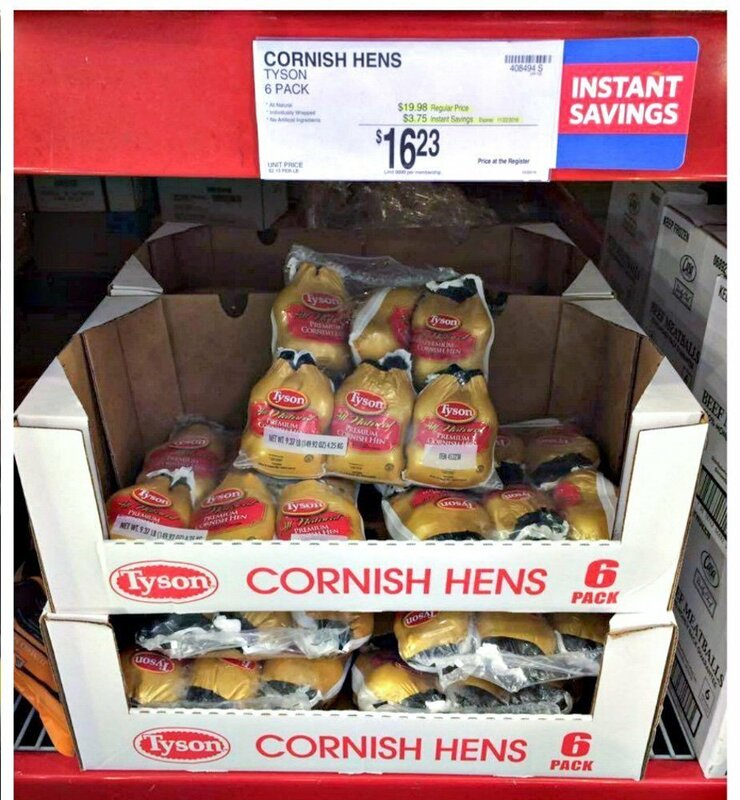 Tyson® Cornish Hens became a holiday favorite once the boys grew up and we mostly entertained with friends back in Arizona. 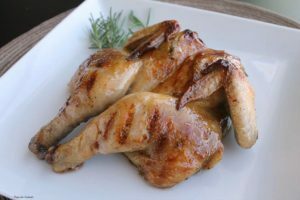 Not only are Cornish hens (a small breed of chicken) delicious little birds, they are so easy to make! Typically I like to spatchcock or butterfly the hens so they cook more evenly. Since this is the year of change I halved them instead. Two things I discovered – half a hen is a decent portion for one person. Halves are easier to eat in a non-traditional setting, i.e. sitting with friends around a fire pit instead of the dining room table! Which brings me to Friendsgiving Entertaining Tip #2 – skip the traditional place setting and serve food family-style instead. Gathering with friends around a big platter of good food warms my heart. Snack boards and party platters have been my thing lately. 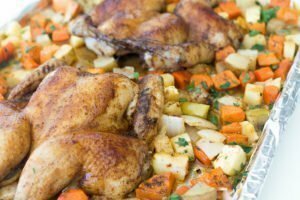 Sheet pan meals are another casually festive option. We really prefer a minimalistic approach to entertaining at this stage of life. I pick two or three dishes that work in harmony with each other. 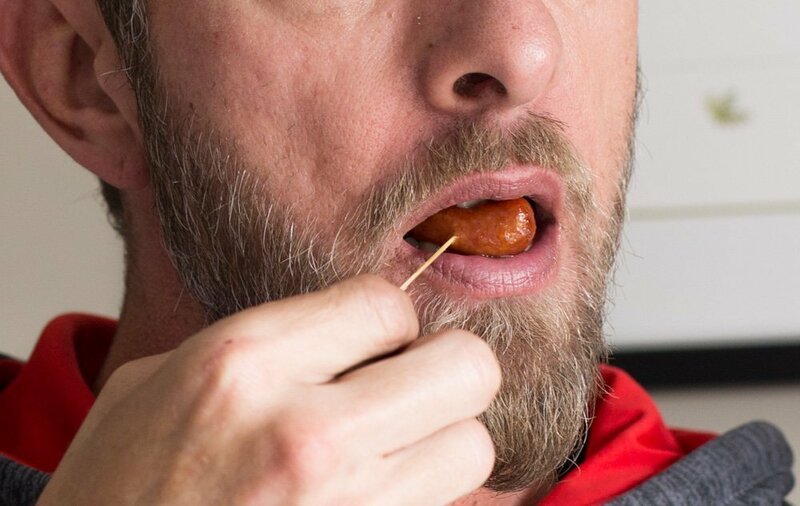 For example my Friendsgiving Entertaining Tip #3 is to keep things simple and use what you have. I like to have a teaser to kick off the meal. In this case I took the extra sweet chipotle glaze from the hens. 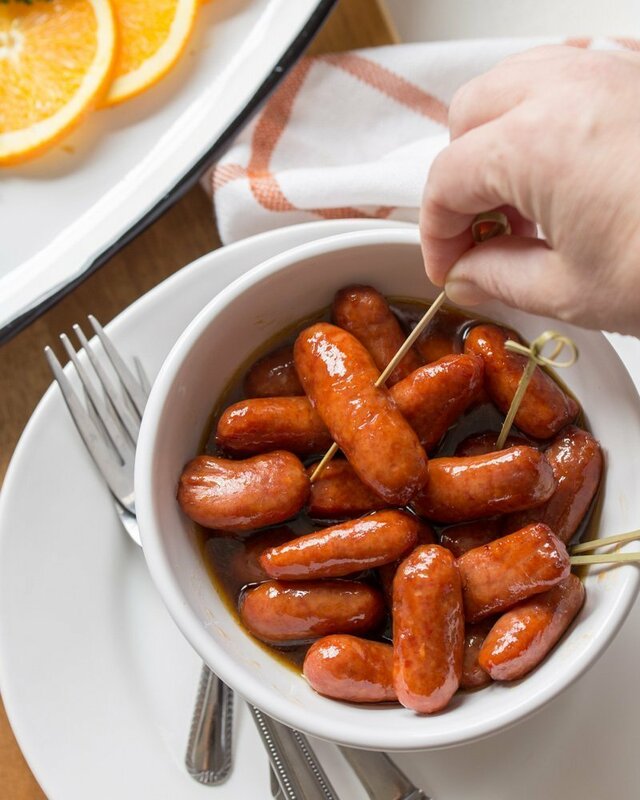 And used it as a sauce with Hillshire Farm® Lit’l Smokies® Smoked Sausages. One sauce = two flavorful dishes – with a lot less stress too! 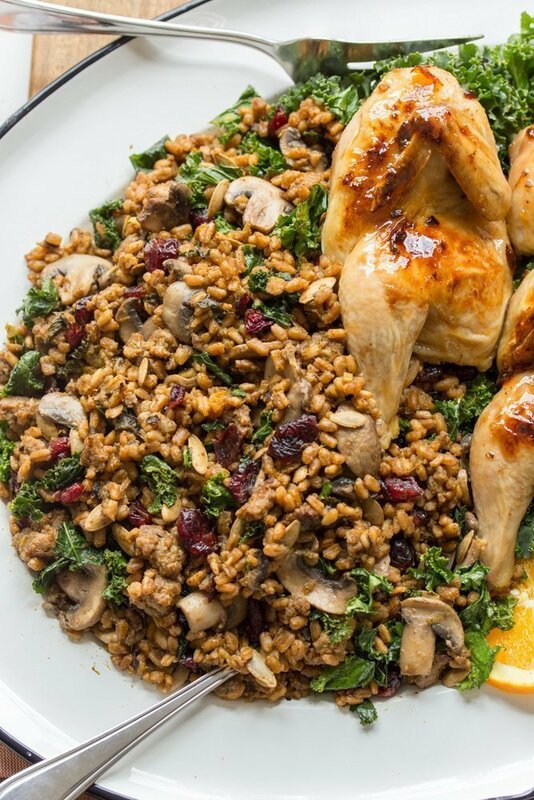 I hope you like my Sausage Farro Stuffing as much as we do. 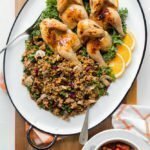 If you love this easy Friendsgiving recipe you can find more like it by checking out my Side Dish section! For recipe entertaining tips delivered to your inbox, subscribe to my newsletter, follow my photography journey on Instagram, and for generally inappropriate humor follow like me on Facebook! 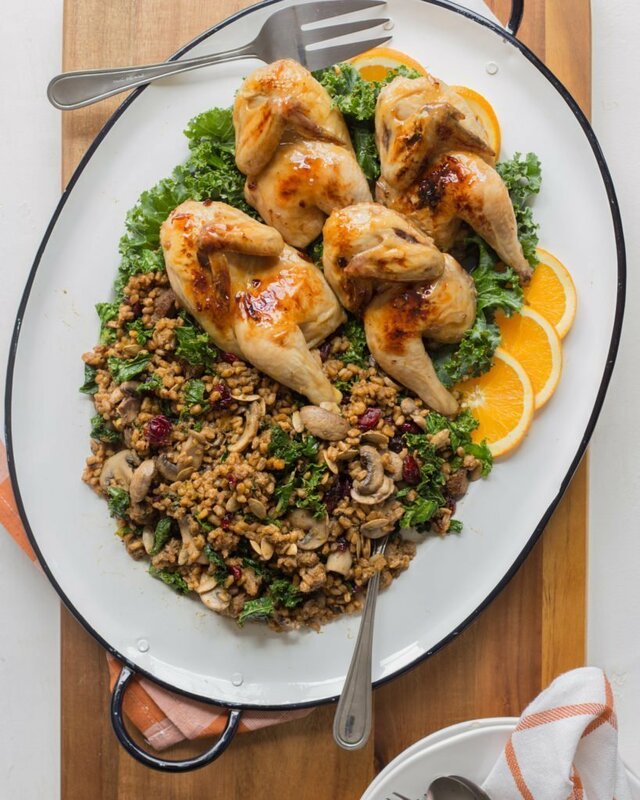 An updated holiday side dish made with ancient grains, butternut squash and kale. Cook sausage in a large Dutch oven over medium heat until mostly browned. Break meat up with a spatula or wooden spoon. Add mushrooms, leeks and dried cranberries to pot. Cook 3-4 minutes, stirring frequently. Use a slotted spoon to scoop mixture into a bowl, reserving fat in pot. Set sausage mixture aside. In a medium bowl toss butternut squash with spices and salt. Add 1 tablespoon oil to pot if needed. Add squash and cook 3-4 minutes, stirring occasionally until slightly browned. Mix in farro, cook 1-2 minutes. Stir in stock, scrape bits off bottom of pot. Bring to a boil and cover pot. Reduce heat to medium low, simmer 15-20 minutes until squash cooks down and farro is tender. Stir in sausage mixture and kale. Cook 2-3 minutes until warmed through and kale is slightly wilted. Salt to taste. Serve warm.